Understanding what lies beneath the soil surface and using that knowledge for productivity gains is at the heart of a massive precision agriculture program currently being implemented on Hassad Australia’s properties across Australia. The 18-month project involves an in-depth study of more than 40,000 hectares of cropping and grazing land across New South Wales, Victoria and Western Australia. Senior agronomist for Hassad Australia based in Dubbo, Scott Ceeney, said the work would give them a better understanding of the capability of their assets, leading to better decision making, as well as assisting in more accurately targeting productivity gains. “On some of our farms the program has been very successful, very quickly, and on others we’ll need to dig a bit deeper,” he said. The corporate farm is working with Precision Cropping Technologies (PCT) to map changes in soil profile conditions using electromagnetic (EM) and gamma radiometric surveys. Hassad Australia accumulated its properties relatively quickly between 2010 and 2014 and not a lot was known about the soils before the mapping work began. “One of the objectives was simply to understand our assets better,” Mr Ceeney explained. Scott Ceeney, Senior Agronomist for Hassad Australia, is using soil testing as part of a massive precision agriculture project on a range of properties across Australia. 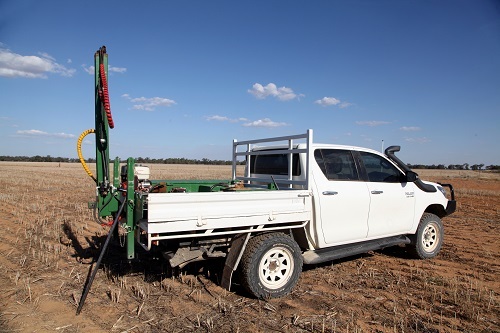 Precision Cropping Technologies have been mapping changes in soil profile conditions for Hassad Australia, using electromagnetic (EM) and gamma radiometric surveys. Collecting the data involved PCT staff driving up and back across the properties on 36 metre widths, continuously taking readings with the electromagnetic and gamma radiometric sensors. The recordings from the survey were used to create surfaced maps of each of the four depths of sensitivity from the DualEM and four bands from the gamma radiometrics. Soil maps like these are then used to define where soils change and guide soil testing. This shows the electromagnetic survey data for a paddock, to a depth of 125 cm. The maps indicate changes in the soil profile conditions which can be driven by both physical and chemical soil characteristics, including changes in texture, depth of soil and subsoil constraints like excessive sodicity and chloride. Michael Wells from Precision Cropping Technologies said PCT’s agCloud soil sensor maps were an excellent guide to soil variability. “When we’re working with customers like Hassad Australia, we’re helping them learn more about their farms and the nature of variability, and how it affects production and profitability,” he said. Mr Wells said the process often started with farmers picking up variability on a yield map and looking to find the cause. By analysing changes in the soil environment, they can see and statistically analyse if there is a correlation with the yield map. “Changes in soil conditions are often the major driver behind the variation in production within a field or farm,” he said. “Soil sampling and soil testing is the next step, to provide an objective measurement of these changes. With Hassad Australia, for example, the initial scanning and mapping process provided a very clear guide for testing. PCT provided Hassad Australia with a detailed prescription for soil sampling, down to individual GPS points for each soil core. “It showed how many samples we needed to take for each test to be representative and exactly where they should be taken from,” Mr Ceeney said. Around 2500 soil tests have already been taken as part of the program. An extensive soil testing program is being used to determine the nature of the variability on Hassad Australia’s properties and its agronomic importance. Around 2500 soil tests have been taken so far. Hassad and PCT are using Incitec Pivot Fertilisers’ Nutrient Advantage laboratory for soil testing on the east coast, a NATA accredited laboratory specialising in soil, water and plant tissue testing for farmers. “We’re 75% through the soil testing component of the process now and it’s been fantastic,” he said. The results are prompting a range of changes. “We are looking closely at some areas of continuous cropping country that may be better utilised under perennial pasture, because of high chloride results,” Mr Ceeney said. Nutrient Advantage was selected for the analysis work for its consistency and reliability. “There’s a progressive learning that comes from sampling and testing and we use Nutrient Advantage for regular soil testing on all our east coast properties,” Mr Ceeney said. Hassad Australia’s farm managers also conduct a range of nutrient response trials each year and these are supported by soil testing and satellite imagery. The commitment Hassad Australia is making to soil surveys and soil testing is an excellent base for ongoing success, according to Jim Laycock, Agronomist with Incitec Pivot Fertilisers, based in Cowra. “Soil testing is still the best way for farmers and their agronomists to understand their most valuable asset, their soils, as well as better manage fertiliser inputs for productivity and profitability,” he said. For Mr Ceeney, the project is just one part of a wider precision agriculture program across the company, focused on maximising productivity gains, targeting cost reductions and better managing risk. “In my opinion, we have chosen the ideal industry leading partners in PCT and Nutrient Advantage for the completion of this program and we look forward to its continuing success,” he said.